Well done to everyone who made the effort for our latest awayday at Bramley Parkrun. Looked like a good one. Well done Paul and Darren on your PB’s. Bright sunshine greeted us when we arrived in Roundhay, quite a difference from the last few days. 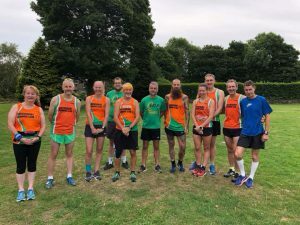 A good turn out from QRC saw 16 of us meeting at the starting point where we were given a warm welcome by all at Roundhay Parkrun, what a friendly bunch they were. After the usual formalities were finished by the RD and with a quick 3-2-1-GO we were off, up the lane, left at the mansion, across the top of the park before a left turn down the hill passed the cricket pavilion (where Steve Brook must have been taking tips from the immaculately cut cricket square) then down to the Lakeside cafe, left and up the hill and back to the start line and onto the 2nd lap. A fantastic m mornings racing and hopefully not too long before our next away Parkrun, where hopefully more of you will join in the fun. Well done to all who came, we were FAB!! 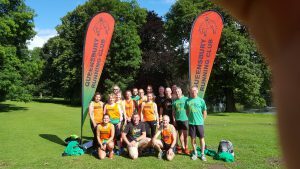 This week saw 26 Queensbury RC runners participate at 5 courses. Philip Lickley Halifax parkrun 23:13 31st First time! Joe Fielder Halifax parkrun 24:16 39th First time! Rebecca Smith Halifax parkrun 30:24 101st First time! Richard Newberry Halifax parkrun 30:50 107th First time! Chelsea Young Halifax parkrun 32:53 127th First time! Congratulations to Tom Collinge for coming in first place at the Halifax parkrun. This is his 17th first-place finish at a Parkrun! Well done to Daniel Moore for making his first Parkrun reappearance after 23 weeks. Will we see you next Saturday? Well done to Michelle Greenwood for beating her previous PB by an impressive 37 seconds! Well done to Neil Windle for beating his previous PB by an impressive 120 seconds! Well done to Rachael Archer-Smith for beating her previous PB by an impressive 67 seconds! Helen Gibbons has run her 40th Parkrun. Good work! Richard Newberry completed his first Parkrun. Good work! Chelsea Young completed her first Parkrun. Congratulations! This week saw 26 Queensbury RC runners participate at 6 courses. Declan Craven Halifax parkrun 27:12 71st First time! David Hepworth has just done his big 50th Parkrun. Well done! Well done to Rachael Archer-Smith for making her first Parkrun reappearance after 24 weeks. Will we see you next Saturday? Well done to Joanne Punt for beating her previous PB by an impressive 546 seconds! Well done to Craig Smith for beating his previous PB by an impressive 41 seconds! Andrew Stott has run the most Parkruns without missing a single week, with 7 consecutive runs. Can his keep hold of this title?! 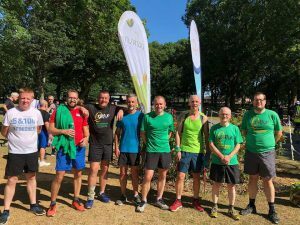 Carl Heron has run his 25th Parkrun. Halfway to the exclusive 50 club. Nice! 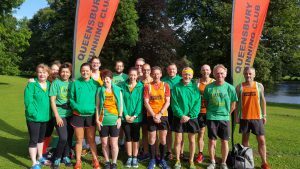 This week saw 24 Queensbury RC runners participate at 3 courses. Congratulations to Chris Williams for coming in first place at the Horton Park parkrun. This is his 14th first-place finish at a Parkrun! Well done to Jack Simpson for making his first Parkrun reappearance after 16 weeks. Will we see you next Saturday? Well done to Michelle Greenwood for beating her previous PB by an impressive 159 seconds! Well done to Hannah Cliffe for beating her previous PB by an impressive 175 seconds! Well done to Elspeth Whittaker for beating her previous PB by an impressive 35 seconds! Michelle Greenwood and Joanne Fortune and Rob Glover and Sharan Loughran have run the most Parkruns without missing a single week, with 3 consecutive runs. Can they keep hold of this title?! This week saw 9 Queensbury RC runners participate at 5 courses. Michael Herbertson York parkrun 19:36 38th First time! Craig Richardson has run the most Parkruns without missing a single week, with 9 consecutive runs. Can his keep hold of this title?! Leanne Alston Halifax parkrun 26:37 41st First time! Well done to Sharon Elliott for making her first Parkrun reappearance after 23 weeks. Will we see you next Saturday? Craig Richardson has run the most Parkruns without missing a single week, with 8 consecutive runs. Can his keep hold of this title?! The club matched their biggest turnout at a single Parkrun course this week with 19 members at the Halifax parkrun. Keep up the good work! Philip Lickley has run his 25th Parkrun. Halfway to the exclusive 50 club. Well done! Beverley Morritt has run her 20th Parkrun. Good work!